What do those numbers and letters mean? What are all those number and letter combinations that appear in daffodil catalogues? The Daffodil Society follows the Royal Horticulture Society’s (RHS) daffodil classification system. In 1975, the RHS adopted a colour code system devised by American Dr. Tom Throckmorton. Daffodils are given a colour code to describe both the perianth (petal) colour and the cup colour. When looking at a ‘daffodil code’, the first number is the division used to categorise the daffodil. The letter or group of letters that follows the number, represents the perianth (petal) colour. The petal colour is described by beginning at the outside edge of the petal, then the middle, and lastly the inside part next to the corona. The second letter or group of letters represents the colour of the corona (trumpet or cup) starting from the eye-zone, then the mid-zone and extending out to the edge or rim. length of the perianth segments (petals). of the perianth segments or the corona or both. Perianth segments spreading, not reflexed; flowers fragrant. compared with corona; filament and style are usually curved. segments usually in two whorls of three. 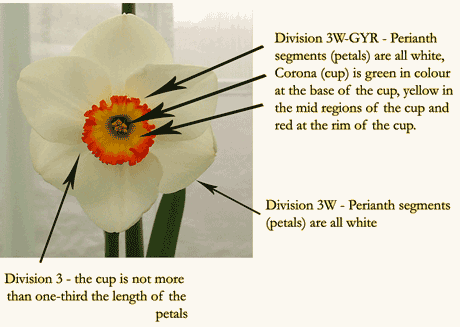 Daffodil cultivars which do not fit the definition of any other division. All species and wild or reputedly wild variants and hybrids.